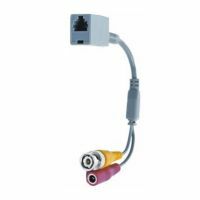 This REVO 10 ft. RJ12 Cable makes connecting the security camera to the DVR as easy as plugging in a phone line! 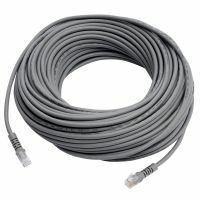 This REVO 10 ft. RJ12 Cable makes connecting the security camera to the DVR as easy as plugging in a phone line! The all-in-one cable supplies power, data and video with ease. RJ12 coupler included for connecting two cables together. Q:Is RJ 12 the same as ethernet? If not what is the difference? 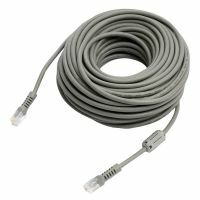 Is RJ 12 as readibly available as ethernet cabling? A:Rj 12 and cat5 are different. The cat5 have twisted pairs and the Rj12 is a 4 wire cabling and not readily available in many places.You usually have to order this cable from Revo. Is RJ 12 the same as ethernet? If not what is the difference? Is RJ 12 as readibly available as ethernet cabling? Rj 12 and cat5 are different. The cat5 have twisted pairs and the Rj12 is a 4 wire cabling and not readily available in many places.You usually have to order this cable from Revo.